Onion bisque, a decidedly humble food, bridges the seasons of winter and spring in a beautiful marriage of overwintered onions and shallots with the new leeks of early spring. While many traditional bisques rely on thickening from cream or a floury roux, this simple onion bisque relies instead on a smooth body of pureed leeks and shallots for its creamy texture and appearance. Graced by four members of the allium family, the bisque is very faintly sweet with an evolving depth as the flavors of leek, onion, garlic and shallot intermingle. It’s about this time of year, the late days of winter and the early days of spring, that I evaluate our cupboards, cabinets and cellar. In preparation for coming season, we run through our stored squash, potatoes, onions, garlic and shallots; we scour the freezer for stray bags of sweet cherries that we may have missed and we make an effort to snack on dried pears, peaches and other food preserved from the year before. It’s at this time, when we use up all that’s left of the previous season and soups like this onion bisque are formed: a marriage of seasons born from an ever-evolving attitude of frugality. We don’t want to waste any bit from the previous year’s harvest before entering that of the new year. The allium family – a grouping of temperate-climate flowering plants gives us the onion, shallot, garlic, leek and chives. Historically, alliums were classified within the lily family and, undoubtedly, they share a resemblence and may also share a common ancestor. It’s these plants with their sweet and pungeant flavor, that provide so much depth to cooking – seasoning the base of many dishes and representing an essential component in French mirepoix, Cajun trinity and Spanish sofrito. Of course, not everyone loves the alliums as much as the French and Spanish. Indeed, onions and garlic are avoided in classical Ayurvedic cooking while Arab folklore contends that, when the Devil was cast from the Garden of Eden, garlic sprang from his left footprint and onion sprang from his right. 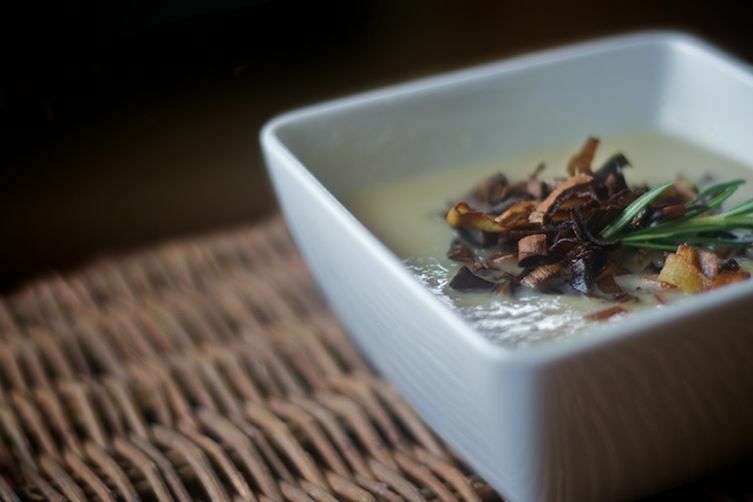 As for me, I relish them all – Devil’s footprint or no, and the pinnacle of my delight in the devilish alliums is this onion bisque which combines four fragrant cousins in one ethereal bowl. 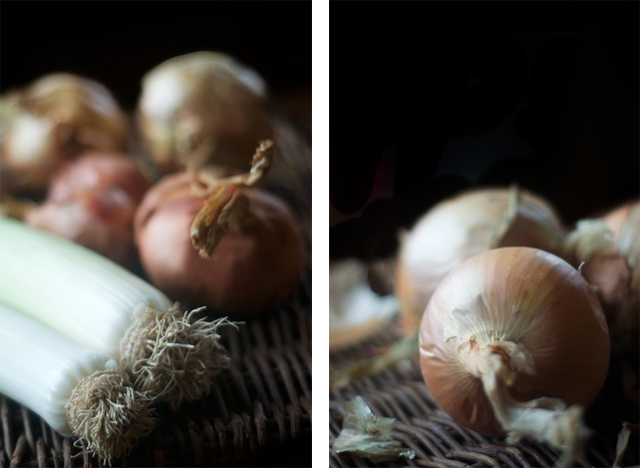 Aside from legend, lore and history, garlic, onions, leeks and shallots as used in this recipe for onion bisque, are deeply nourishing. Consumption of garlic has been linked to reduction in the risk of stomach and colon cancers as well as cardiovascular disease and hyperlipidemia. It’s also known to help reduce blood sugar and combat the common cold. 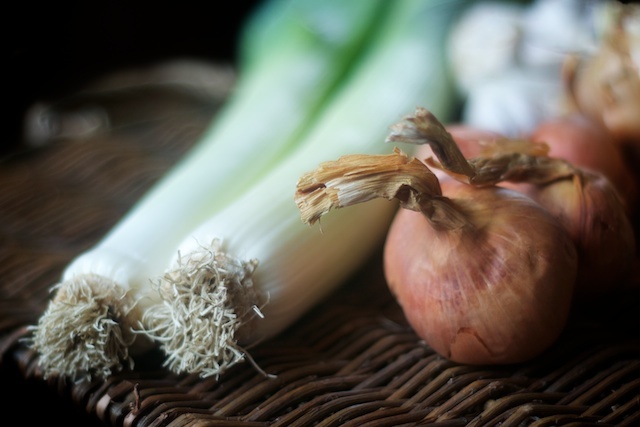 Onion bisque recipe with frizzled leeks: this bisque features onions, leeks, shallots and garlic. Easy to make, the recipe comes together in a half hour. Melt ghee in a heavy-bottomed skillet over a moderate flame, then toss in rosemary, sliced leek, shallots and onion. Sweat the onion, leek and shallots in ghee until fragrant and tender, about five minutes, then remove rosemary and discard. Pour one and one-half quarts roasted chicken stock over the tender leeks, onions and shallots and simmer, covered, for twenty to twenty-five minutes. Using an immersion blender, blend the soup until smooth and uniform in texture. Stir in vinegar and season with unrefined sea salt and ground white pepper. Dress the onion bisque with frizzled leeks just before serving. Melt ghee in a cast iron skillet over a moderately high flame, then toss in sliced leek. Fry the sliced leeks in ghee until browned and crisp. Remove immediately from the pan and serve over onion bisque. If yes, should it be frozen at a certain step in the process? how much fizzled leeks (ingredients) to use so that it will not be ‘overpowering’? I was so excited to see this recipe until I got to “1 quart roasted chicken stock.” Why is this tagged as vegetarian? Recipe ingredients call for 1 quart roasted chicken stock. However, recipe instructions says to pour 1 1/2 quarts roasted chicken stock over…. Wrong Email address previously given! This one is correct. Question remains the same. Which amount is correct: 1 quart roasted chicken broth or the 1 1/2 quarts in the instructions? ?